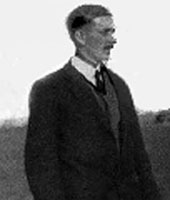 Robert Doig was born in Inveresk, Musselburgh in 1876 and was one of the legion of Scots golf professionals who worked in continental Europe. He was responsible for the design of the 9 hole track at Marienbad (now Mariánské Lázne and counted as the Czech Republic’s first course) in 1905 and became professional there, in the summer months, in 1907. Winters he spent as professional in Rome. It seems he was also responsible for the recruitment of instructors at Carlsbad such as James Sorley. With the shadow of war hanging over Europe in 1914, he sent his wife and children home with his brother and assistant James and, although they lost most of their belongings on a complicated return via Denmark, they were not interned. Robert was not so fortunate. His passport was confiscated and attempts to get him out by the American ambassador proving fruitless, he obtained a statement from an Austrian doctor that he was unfit for military service and was given a pass which got him to Italy. After a few months at home in Musselburgh he returned to Rome in November 1915 to take up his duties there. A later newspaper report of him attending his parents’ golden wedding celebrations in Musselburgh in 1926 suggests he was also professional at Lucerne in Switzerland at some point.